All people are complex and dynamic beings that are affected by social, environmental, cultural, gendered, racialized, and spiritual structures and occurrences. The pieces presented in “The Human Experience” illustrate societal issues that are affecting the global community and are not characteristic of any one demographic. 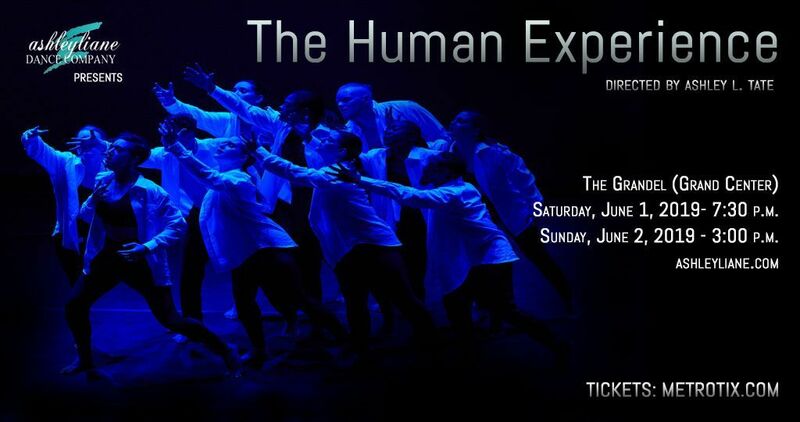 This concert uses the vehicle of dance to help foster understanding and cohesion between individuals to further promote the power of a shared human experience. The trials that individuals face may occur in differently depending on one's environment and background, but the core concept of these trials is a universal experience. Founder and Artistic Director Ashley L. Tate brings her company of trained classical, contemporary and commercial dancers to The Grandel for a weekend of performance art. Do not miss this diverse concert featuring the choreography of Ashley L. Tate, as well as guest choreography team, Marcus and Paige Johnson. All of those attending MUST be ticketed. There are no refunds issued for lost or stolen tickets. Children (ages 2 and under) may attend for free if sharing a seat with a paying adult. Children (ages 2 and under) may attend for free if sharing a seat with a paying adult.